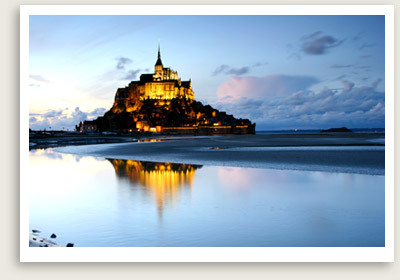 Tours Inclusions: private tour guide, entrance to the Mont St. Michel Abbey, private transportation, taxes. Departure points: Caen-Ouistreham. Other departure points available. NOTE: You may customize your day tour. Inquire. Embark on one of our private tours of Mont St. Michel and Bayeux from the port of Caen. Our private tours Mont Saint Michel and Bayeux are conducted by excellent English-speaking tour guides in Normandy. Tour Mont Saint Michel, whose namesake bay boasts one of the world’s highest tidal ranges, is a truly memorable sight. Your private tour of Mont St. Michel begins at the Abbey, founded at the turn of the 8th century. The Abbey became a major cultural and pilgrimage center during the Middle Ages. You will visit the Romanesque Church, the Gothic “Marvel” with the monk’s cloisters and refectory, the Knights Room, the Guest Room, the Undercroft, the Refectory, and more. The tour also includes several chapels: St. Stephen, St. Martin, Our Lady Underground, St. Mary Magdalene, and the 11th-century Crypt of the 30 Candles. Next on your Normandy private tour is Bayeux, home to one of the oldest tapestries in the world which you will see in the Bayeux tapestry museum. The 230-foot-long medieval cloth explains through its embroidered Latin inscription and pictures the events surrounding the 1066 Norman invasion of England.